Today, we bring back the mystical Article Writing Genie to respond to some new requests from real Expert Authors. Wish #1: Genie, there are so many keywords in my niche to choose from. Give me the keywords and keyphrases that are trending right now so I know where to focus my future articles. Every niche is a little bit different, but many authors run into this problem. They get excited about article writing and have so much of their expertise to share, but they just don’t know where to start. Plus, they want to make an impact on people right now by focusing on keywords that are currently relevant. The problem with the first solution is that your time-sensitive article loses relevancy over time. For example, an article based on the keyphrases “summer 2011” and “fashion trends” will be highly relevant this year, but when 2012 comes around, it’s no longer relevant. Evergreen content is the type of content that stays relevant every year, all year round. Aim for the best of both worlds by writing a combination of both trendy articles and evergreen ones. Here’s where to start: Do keyword research with tools like Wordtracker, Goodkeywords and Google’s Keyword Tool, to build a list of the keywords that are currently popular. Then, go through the list and mark each of the ones that seem to be trendy topics. Make sure you have a mix. Then, each keyword becomes a new article or a whole set of articles. Also, take a look at the success of your own articles by checking the Keyword Referral Stats on your account. Wish #2: Genie, what’s the long tail? I’ve heard it mentioned before, but I’m not sure how it can be applied to my overall writing strategy. First, if you’re looking for a basic overview of what the long tail looks like, check out this video and its accompanying PDF [316KB]. The long tail distribution curve indicates that the most general, basic keywords at the head of the tail generate high levels of interest, but there’s also a high level of competition at the head. As you move down the curve, the keywords become more specific and there’s less of an audience, but it’s also less competitive. Further down the long tail is where your expertise comes in the most handy. It’s where the most detailed articles come from and where you’ll be able to accurately target the types of people looking for your content. However, don’t focus solely on writing for the tail of the distribution. You want to have a wide range of articles covering a lot of different keywords and keyphrases to maximize your exposure. Aim for about 20%-30% of your articles on the keywords at the head of the curve and the remaining 70%-80% at the middle and long end of the curve. 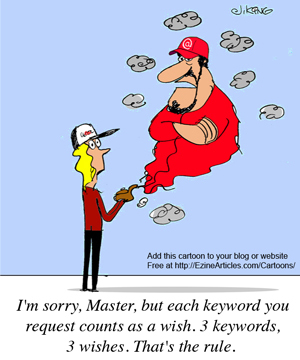 Wish #3: Genie, grant me this one wish to always use the perfect balance of keywords. At first, this seems like a tall order, but it really isn’t as difficult as it sounds. First, don’t try to stuff extra keywords into a sentence that already sounds natural. You aren’t going to be doing yourself any favors if you do that. Instead, write naturally for your audience. Always test the readability of your articles before you submit them by reading them aloud. If something doesn’t sound natural when you read the article aloud, revise it until it does. Never sacrifice readability for anything else. On the other hand, if your articles tend to go off-topic and don’t stay focused on your targeted keywords, the search engines may not recognize your article or index it. Articles like that may be easy-to-read, but they won’t get you any closer to optimizing your content for search engines. To avoid that, create an outline for the article before your start. Then, you should be able to stay on topic and not stray away from your topic and keywords. To see the wishes the genie has granted in the past, click here. I think we all need to spend more time properly researching keywords. I think that when people find it boring and think it won’t make that much difference anyway, they skip through it. It is a big mistake and defeats the object of the exercise. Thank you for the advice. Research about what is on the internet just became easier. Synonyms of keywords are listed last, not mixed in with your search results. How about that for a research tip? Exact matches, all the words, then related in clerly labeled sections only available on my website. If they are expert authors, why are they asking you about this? Surely, they already know or are not expert authors. “Expert Authors” is the term EzineArticles uses for their Contributors. Well, maybe you should not be so generous with your praise? I enjoy being generous with my praise. Why be stingy with a good thing? I am also generous with my smiles. And sometimes I wave to strangers. They usually wave back. Quite often, I write the article first knowing what keywords I want to target, and then write a title around it. Then I edit the article again. Wolfgang, I think that this is the sensible approach. You write for a purpose, not ‘hoping for the best’. Not getting your keywords and phrases sorted out first means you are rambling and you ain’t going to get close to the topic in 400-500 if you take that approach. Yay! I love the article writing genie! I will be back with my wishes later. Thanks for the insight regarding choosing the keywords for my niche. This really helps. Thanks for the 3 ways to approach article writing. I will use them as I create additional articles. There is a lot of talk about how important keywords are in your articles, and I tend to think that they are really important – but it’s all about balance. Too little focus on keywords can hurt your efforts and too much focus can hurt your efforts as well. Good tips. But, in the end, I have tended to work my resulting keyword phrases nicely into my work where it doesn’t sound forced. One thing that I appreciate here at EzineArticles.com is that the monthly reports are VERY enlightening in that they give me a true idea of how people are finding my articles. Frequently, they find me using a term I never would have anticipated! I agree. I love my monthly reports! About those monthly reports, there is just one thing that bothers me. EzineArticles is supposed to be strict with our articles’ spellings and yet when I get a monthly report they are suggesting some keywords that are obvious misspellings. Take for example their suggestion for ‘eye fatigu’. ‘Just wondering why they are suggesting these misspelled keywords for my next articles? I know if you are targeting keywords you should also target misspelled keywords, but that’s not supposed to be a practice with high quality article directory. Thanks for letting us know. I’ll investigate Monday and get that mis-spelling removed as it should never have been in there. This appears to be on your monthly performance summary report. The monthly summary reports provide you with the top keywords used to find your articles. We don’t recommend that you use the misspelling. The report simply tells you what was used to find your article. Thanks, Genie, for granting the three wishes. They are very understandable and very practical. Thanks for the tips Genie. I have a question to ask, What is the monthly summary report? I am new to E-zine and I have never received a report. Am I missing or not using the site correctly?